Munmun Chattopadhyay, Ph.D., has joined the Texas Tech University Health Sciences Center at El Paso Center of Excellence in Diabetes and Obesity as its first faculty researcher and assistant professor. Dr. Chattopadhyay earned her MS degree in zoology in 1993, and Ph.D. in neurosciences in 1998 from Jiwaji University, Gwalior, India. After her post-doctoral training in molecular genetics at the National Institute of Immunology, New Delhi, India, she joined the University of Pittsburgh as a post-doctoral fellow in the Department of Neurology. She became a junior faculty in the Department of Neurology at the University of Michigan in 2004 and research assistant professor in the same department in 2010. She received funding for her basic research from the Diabetes Action Research and Education Foundation, Michigan Diabetes Research and Training Center, and American Diabetes Association. 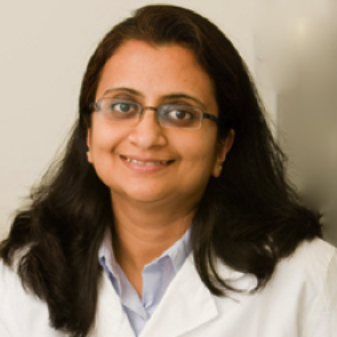 Dr. Chattopadhyay’s labs focus on different models of peripheral neuropathies, including diabetic neuropathy, as well as the treatment of these conditions by the viral vector-mediated gene therapy approach. Her earlier work focused on understanding the pathogenesis of painful neuropathy and development of novel treatments for this condition, which involved the regulation of inhibitory neurotransmitter receptors and ion channel trafficking. Recently, her labs have focused on the contribution of increased neuroimmune activation in the pathophysiology of Type 1 and Type 2 diabetic neuropathy. These studies focus on identifying specific cytokines/chemokines and their interaction with voltage gated ion channels that may lead to targeted therapeutic interventions for diabetic sensory neuropathy. Dr. Chattopadhyay’s lab also concentrates on understanding the role of neuroinflammation in the development of other diabetic complications in Type 1 and Type 2 diabetes, and whether exercise, as well as alternative approaches, could alleviate the development of these complications.